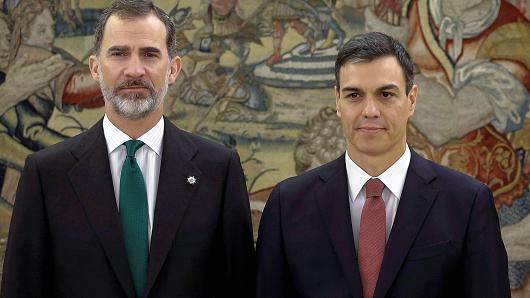 Pedro Sánchez was sworn in Saturday as Spain’s Prime Minister, a day after ousting scandal-hit political rival Mariano Rajoy in a no-confidence vote. Sánchez, who leads the Spanish Socialist Workers’ Party, took the oath of office before King Felipe VI at the Zarzuela Palace near Madrid. He was the first Spanish Prime Minister to be sworn in without a Bible or crucifix, according to his party. Rajoy was present at the ceremony, shook Sánchez’s hand and wished him good luck. Sanchez the 46-year-old politician faces significant challenges as he assumes office. Spain was rocked last year by the Catalan independence crisis, which remains unresolved, and many Spaniards continue to feel the effects of the global economic crisis. Spain is the European Union’s number fourth largest economy and an influential member of the European Union. Sanchez and his party are staunch supporters of the EU and the shared currency.